On December 10, 1946, baseball great Walter Johnson died at the age of fifty-nine. Nicknamed "The Big Train," Johnson pitched his way to fame during twenty-one seasons with the Washington Senators. His fastball is considered to be among the best in baseball history. 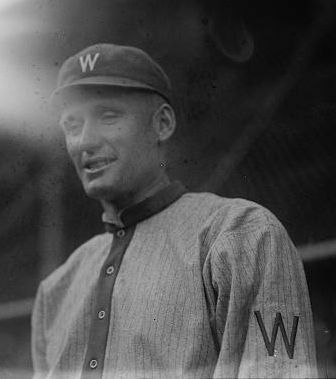 Johnson joined the Senators in 1907 on the condition that the team pay his way home to Kansas if he failed in the big leagues. After a tentative first season, the former high school star found his ground eventually scoring more shutout victories (110) than any other major league pitcher. 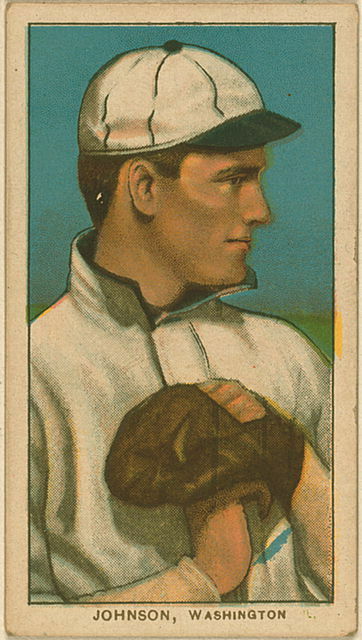 Johnson's 1913 record for pitching fifty-six consecutive scoreless innings stood for over fifty years until Don Drysdale bested it in 1968. His strikeout record (3,508) held until 1983. In all-time wins, Johnson is second only to Cy Young. Walter Johnson was the second of six children born to Frank and Minnie (Perry) Johnson on a rural farm four miles west of Humboldt, Kansas. Although sometimes said to be of Swedish ancestry and referred to by sportwriters as the "The Big Swede", Johnson's ancestors came from the British Isles.